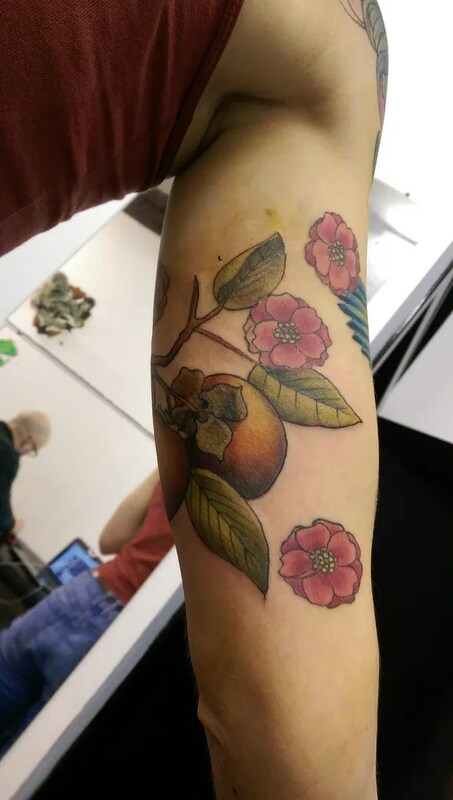 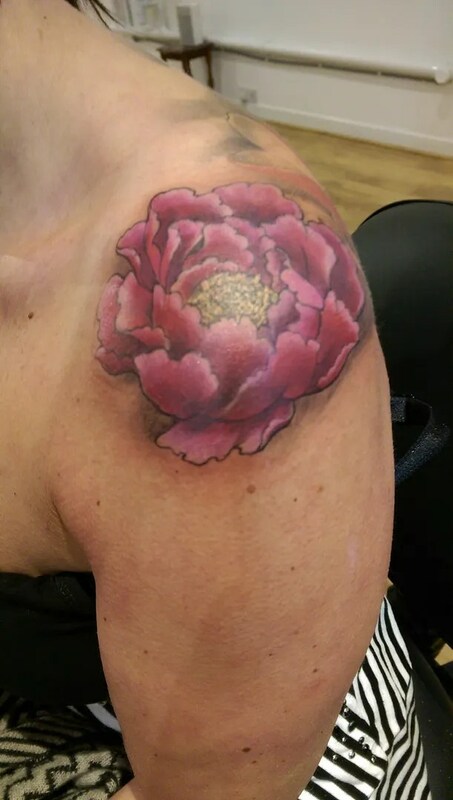 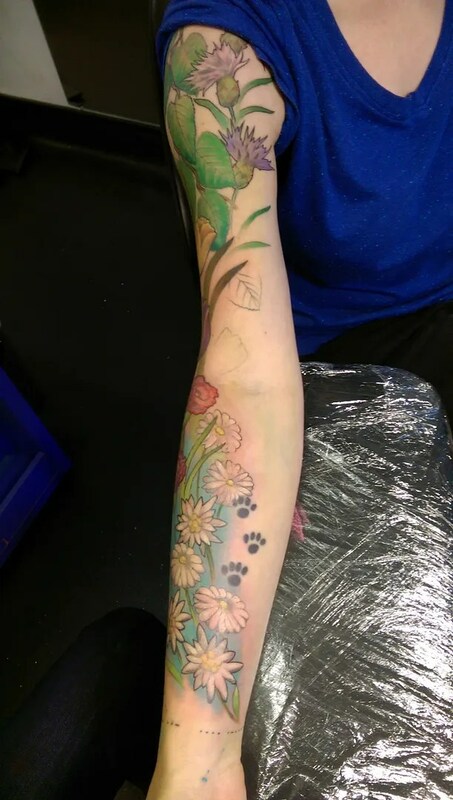 maybe it’s because it’s winter and there are no flowers in bloom, so my customers are recreating them on their skin, but I have a lot of flowers for you in this blog. 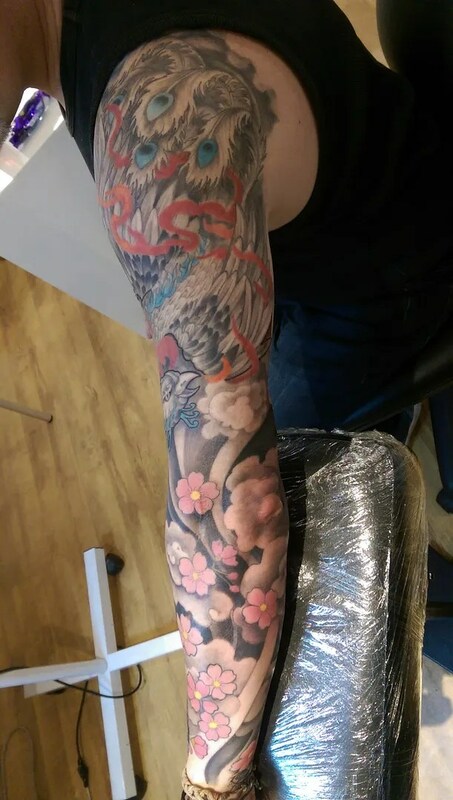 Some japanese work as well, of course, but I find myself doing more and more flowers these days. 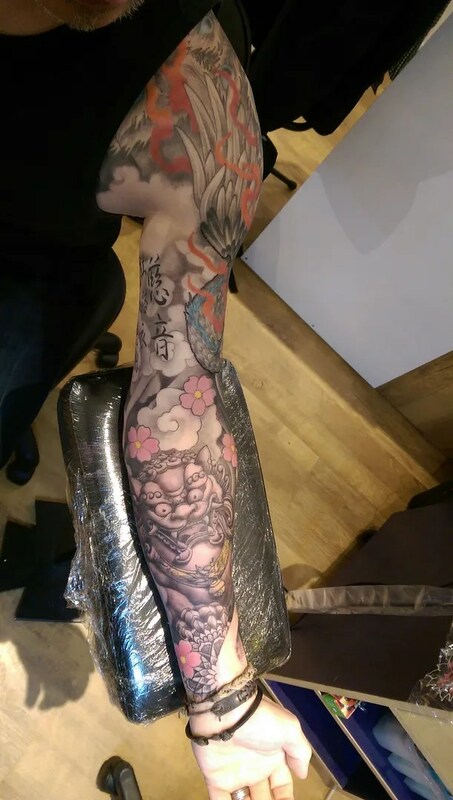 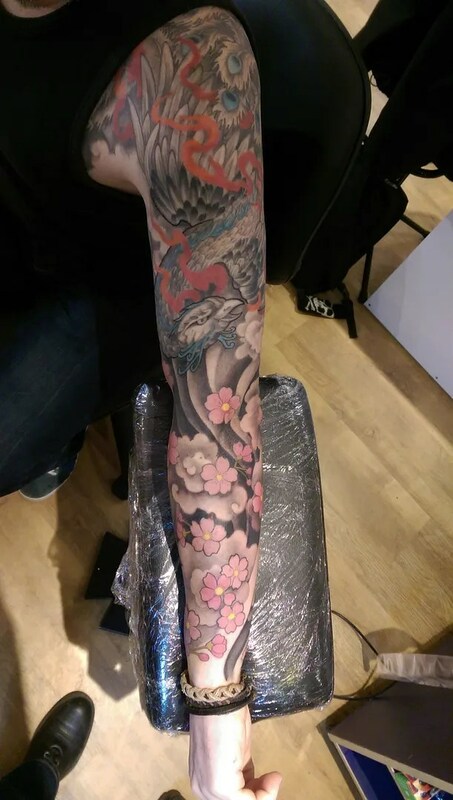 I love flowers AND japanese, so that works out great! 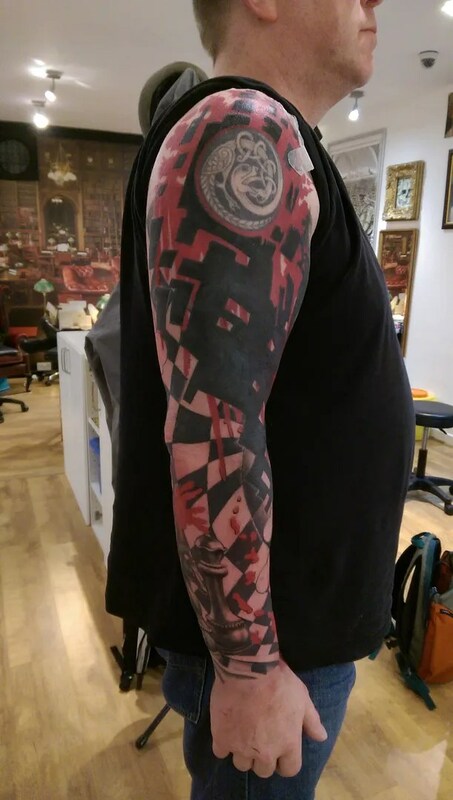 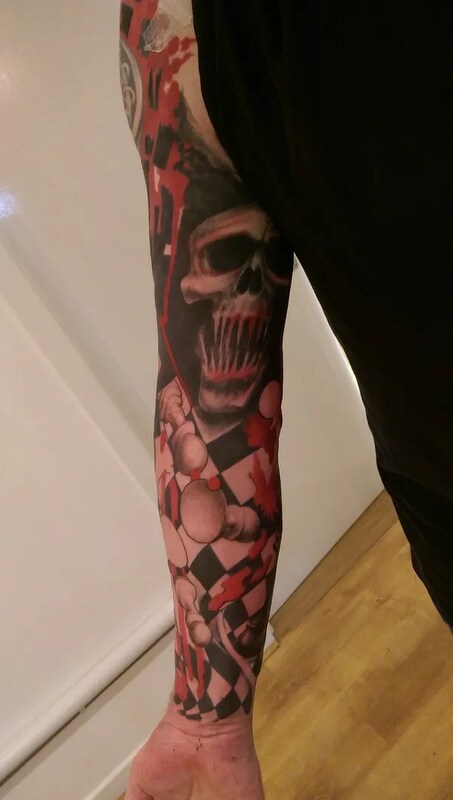 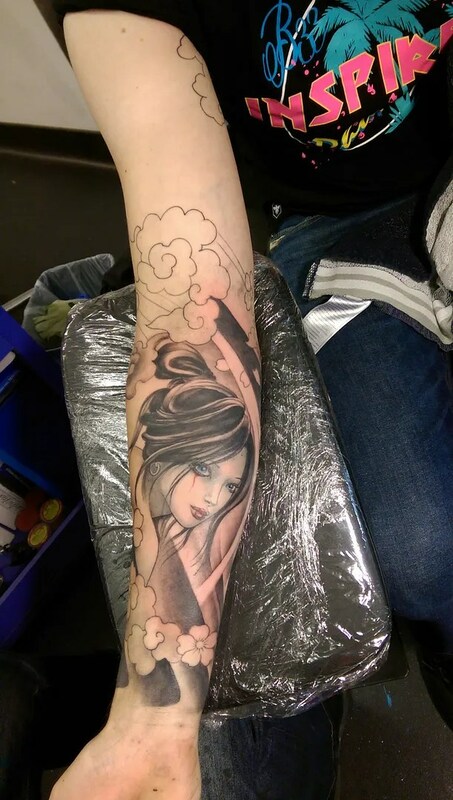 John is working on a mad chessboard sleeve, it’s huge cover up, so it’s a good thing he loves lots of black with strong shapes and movement! 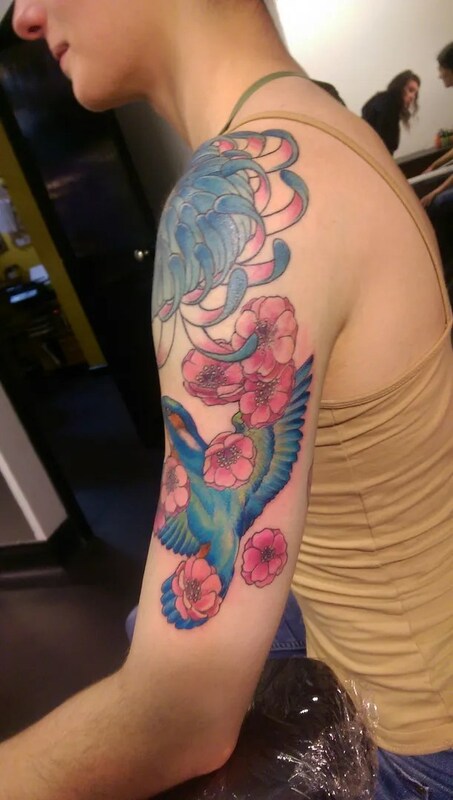 This was John’s concept, in case you were surprised to see this style by me, but I am really enjoying the process. 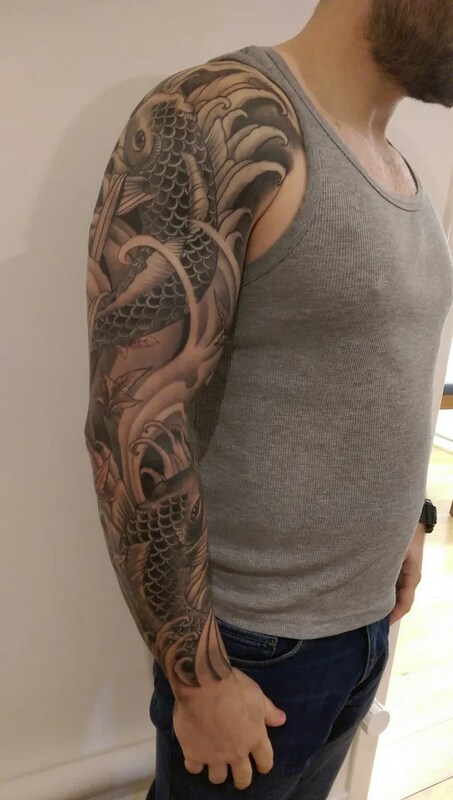 That goes for Dee’s sleeve, too. 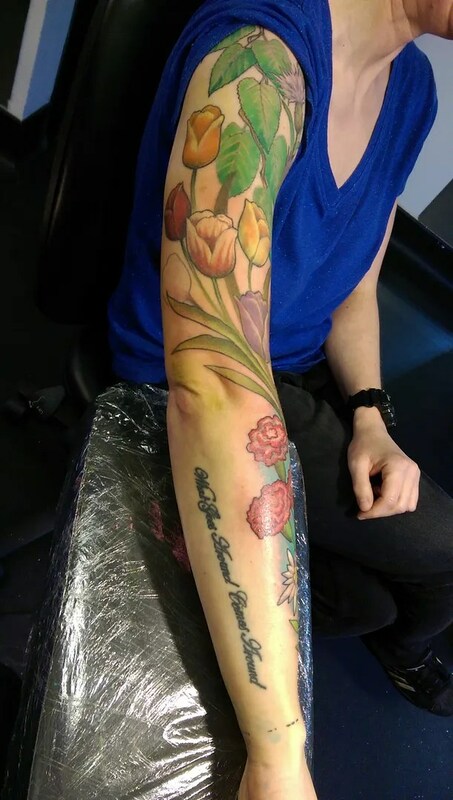 The idea was to get a plant that symbolises every country that she has ties to, so as she is a well travelled lady, that was quite a few! 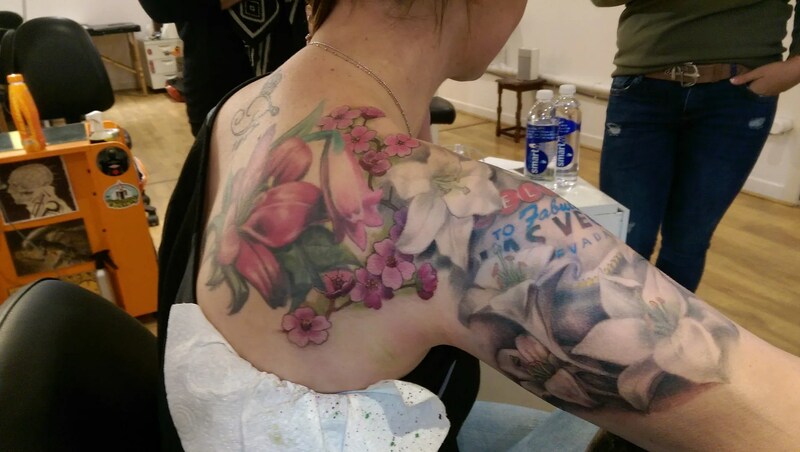 We will be adding more detail as we go along, but are making good progress with the bold foreground flowers. 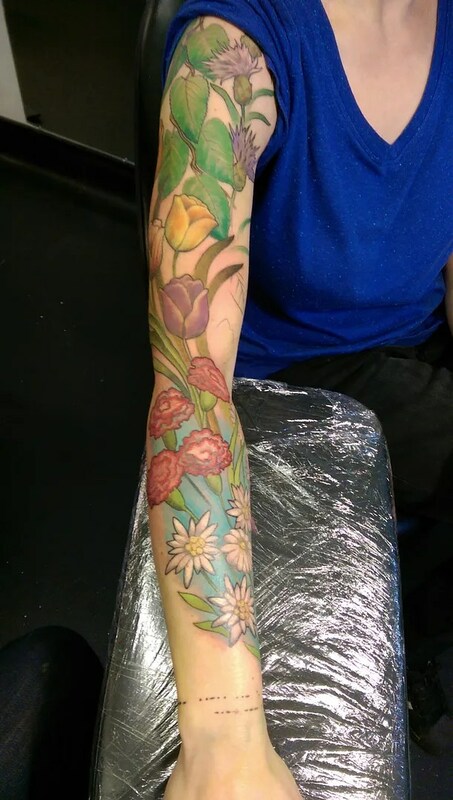 Faye also wanted symbolic flowers, hers were two lilies for her children, in the colours of their birth stones. 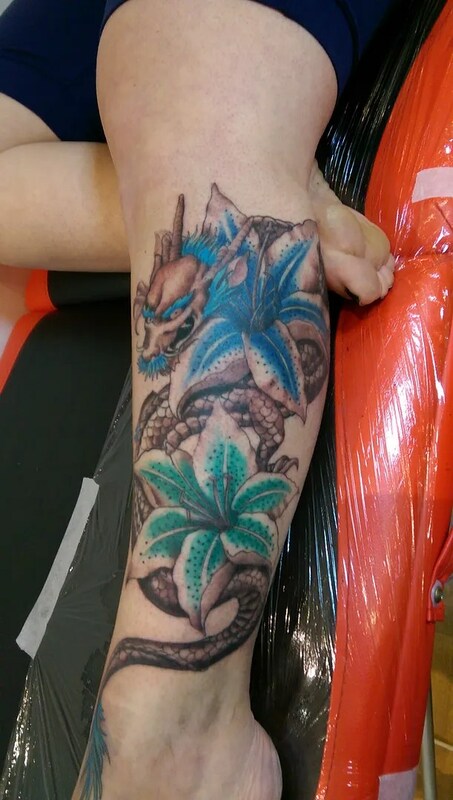 She also added a protective dragon wrapping around them that symbolises herself. 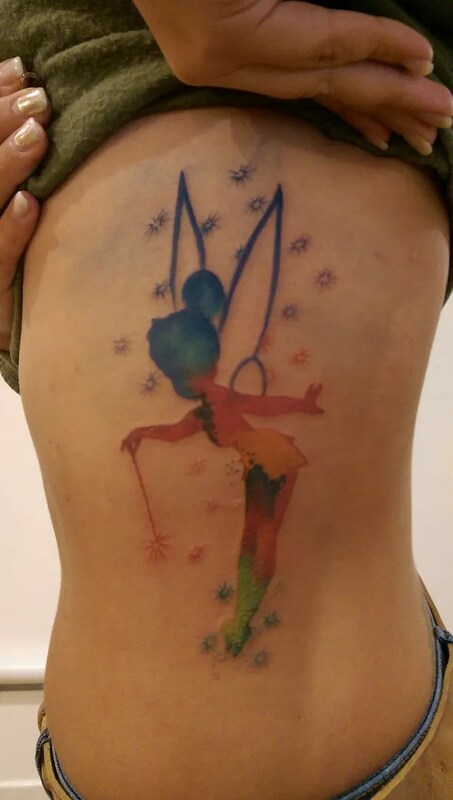 It’s a lovely way to add meaning to a decorative piece. 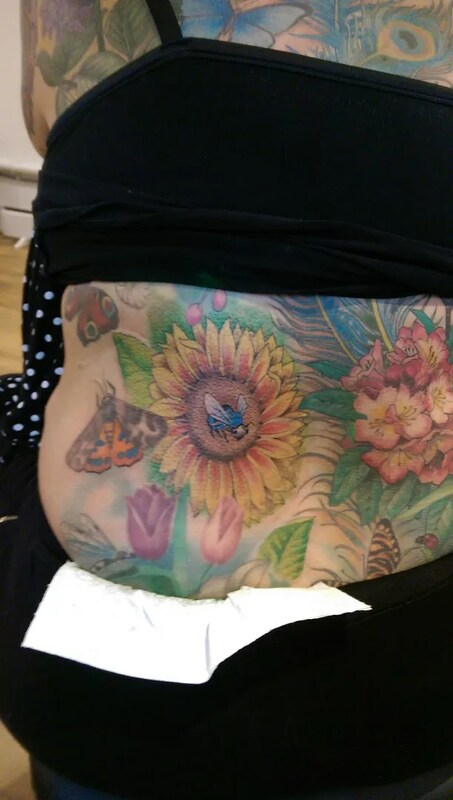 Laurenne has been working on her colourful backpiece in a similar way, here is a detail of a sun flower with a blue bee- yes, they exist, they are called carpenter bees and they are beautiful! 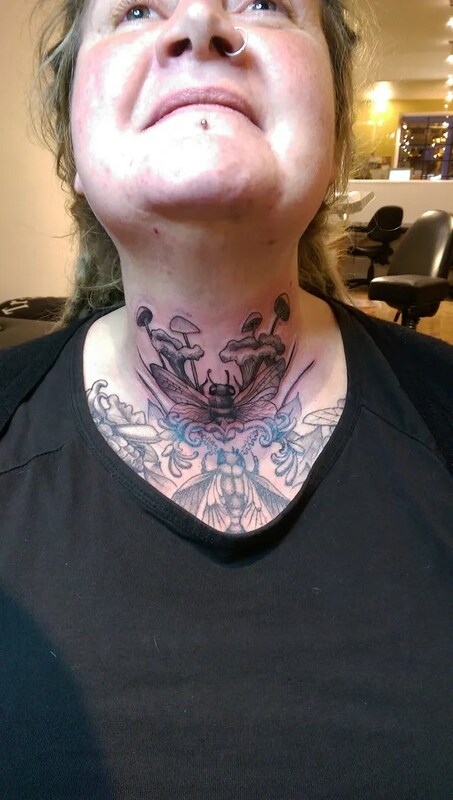 I had three ladies over from germany to get tattooed, they like to come and visit Edinburgh, stay in a hotel a few nights and make a city break of it, and why not, Edinburgh is a beautiful place to visit. 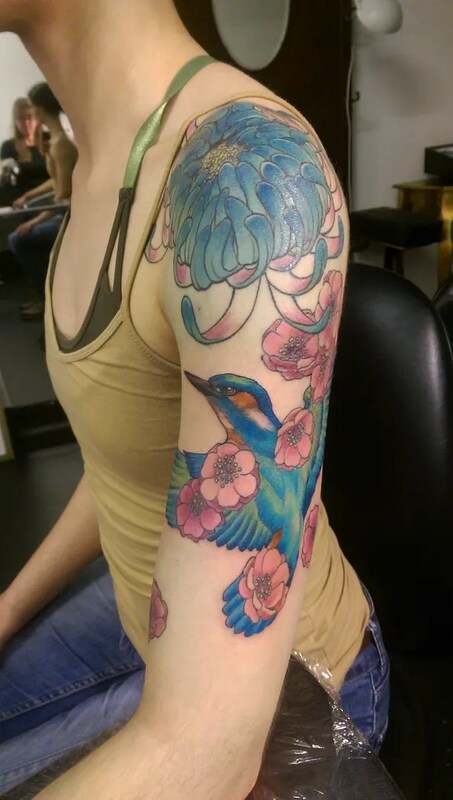 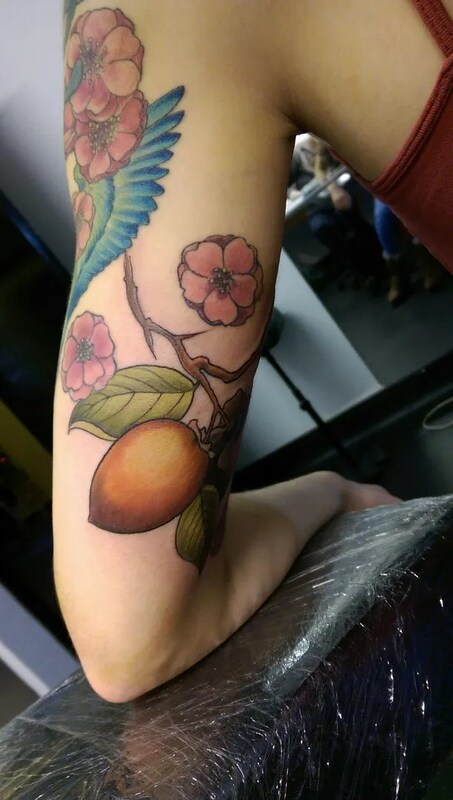 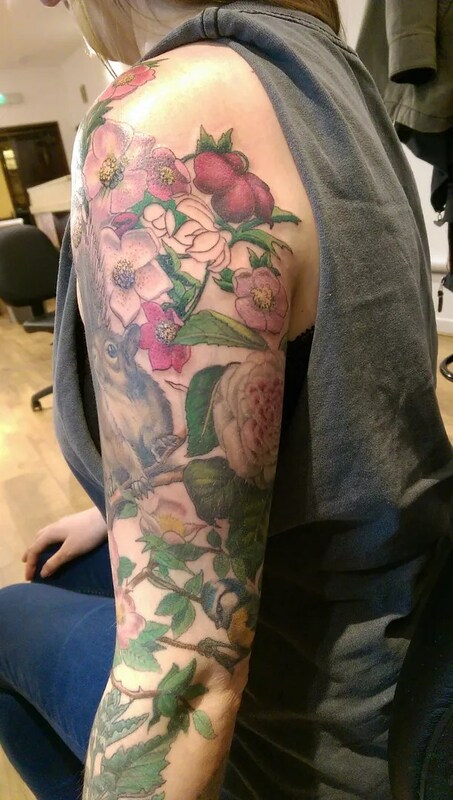 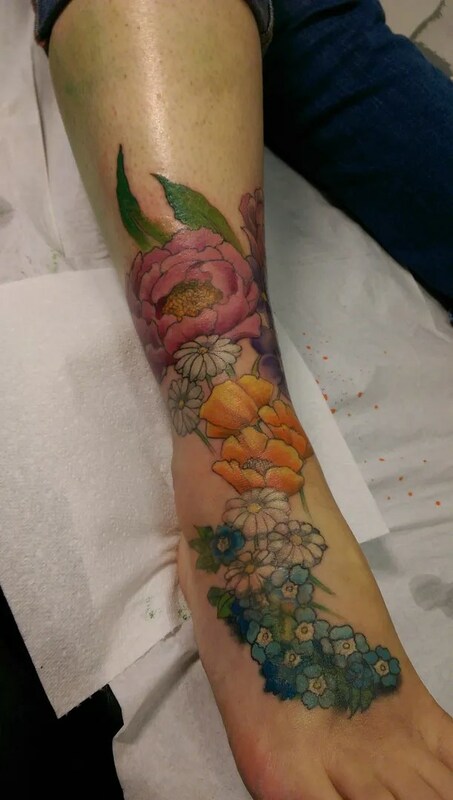 Farah likes the idea of a colourful sleeve that is based around winter, so the plants flower when it’s cold (plum blossom and persimmon) and the king fisher stays and doesn’t migrate to warmer climates, we will be adding snow and snowflakes as we go along- nice idea!